I’m a good friend. I might not pick you up at the airport (I don’t own a car) and I’m also not going to do your windows, but I’m a good friend. Just ask my good pal Josh who sent me the following email on this night; “My whole trip to Utah just got canceled, cause my flight got canceled and they cant get me on another one. CAN WE PLEASE GO DRINK A LOT NOWWWW. Lets go, get a burger, go to a bar, drink my sorrows away!” What kind of person would I be to say no to someone who so desperately needed my attention and time? I can’t and I didn’t. A few moments later I was out the door and on the way to my bar, Idle Hands, located in the East Village of NYC. Josh was already there chugging on a beer when I arrived. “Where can we get a good burger around here?” Josh asked me. That’s an easy question to answer seeing as how Zaitzeff is directly across the street from the bar. Josh clearly had needs and I didn’t want to take a moment of time away from him and our pints of Ommegang Adoration, so I pulled up my Seamless Web iPhone app and ordered up a couple of burgers for delivery. 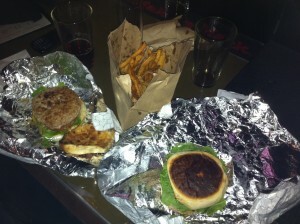 I’ve already reviewed the fantastic turkey burger at Zaitzeff but in case you missed it, click here to read it. What I did want to talk about though was a topping I had not tried there before, jalapenos. Normally when you order jalapenos at any restaurant, you expect to get the pre-sliced, straight out of a jar pickled jalapenos and don’t get me wrong, they are good. But Zaitzeff does it a different way. They take whole, fresh jalapenos, slice them open and cook them on the grill, seeds, oil and all. I was pleasantly surprised when I opened up the burger and saw them. One bite confirmed 2 things, A. they were awesome and B. they were hot and in fact, significantly hotter than what I am used too. 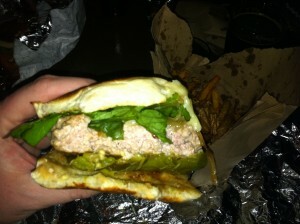 I enjoyed their smokey heat so much that I might consider them to be a mandatory topping on future burgers from Zaitzeff! No need to wait until your friends are in need, head down to the EVILL now for a burger from Zaitzeff while sipping on beers at Idle Hands bar. 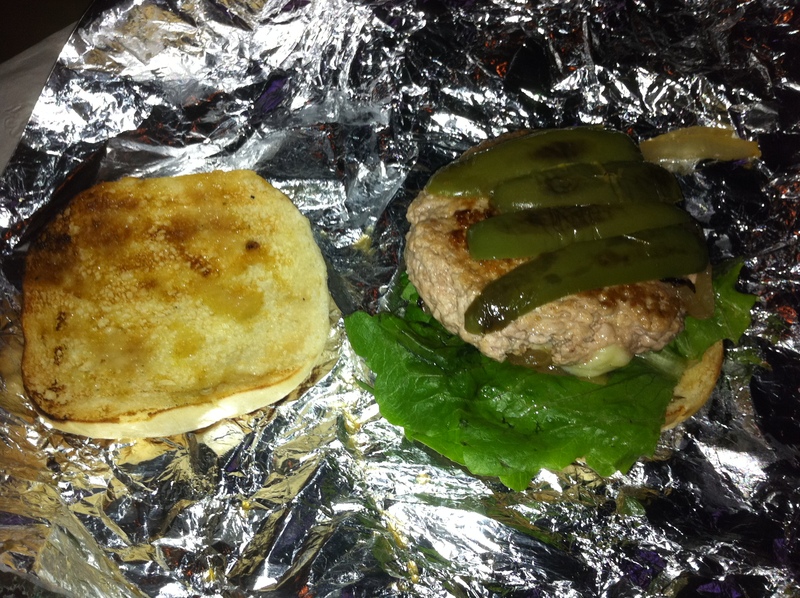 This entry was posted in Burgers, Gourmet Burgers, Hamburgers and tagged avenue b, burger, cheese, ciancio, conquest, east village, french, fries, great, hamburger, jalapenos, new york, ny, nyc, rev, review, the, zaitzeff. Bookmark the permalink.